Baker Institute’s Center for Energy at Rice University recently organised a global energy transitions summit, a forum for key market players and decision-makers to gain insight into the future of the energy industry. Various speakers with expertise in oil, gas, power, solar, energy related technologies and geopolitics discussed how transition from fossil fuels (oil, gas and coal) to renewable (solar and wind) will affect the global energy in the future. The summit was held amid a Wall Street Journal report that some energy experts are predicting the biggest shift in energy consumption since the industrial revolution when coal started to replace fire wood. However, the long term energy forecasts made by governmental institutions such as International Energy Agency (IEA), US Energy Information Administration (USEIA) or even companies such as BP, ExxonMobil, etc do not reflect the impact of energy transitions. For example, according to USEIA, fossil fuels will meet 77% of world primary energy demand in 2040 which is only about 8% less than in 2015. A realistic forecast taking into consideration various factors affecting energy transition discussed in this article would have showed a larger drop for fossil fuels. They do show a drop in coal contribution of about 5% and 3% in oil whereas renewables share goes up by only 7%. Developed countries have already invested in infrastructure needed for fossil fuels (refineries, petrol stations, power plants, pipelines, etc). They, however, need huge investment in the future to transition to renewables. On the other hand, developing countries have the advantage of avoiding huge investment in fossil fuels infrastructure by proper planning and they can leapfrog to renewables as they were able to do with mobile telephony. This clearly shows that India should plan smartly for energy transition. The following example illustrates the complex problems Indian planners will face as India is on the threshold of energy transition along with the rest of the world as discussed in this article. It is time India puts together a high level committee of world class experts with different backgrounds to draw up an action plan for the country. The recent Draft National Energy Plan (DNEP) has made a good beginning. But it failed to incorporate the full impact of energy transition comprehensively (see Table-1). In 2014, the Indian government (under UPA) decided to manufacture diesel locomotives for Indian railways in Bihar and signed a contract with GE. Later, it was signed off by the NDA when Suresh Prabhu was railways minister. When Piyush Goyal took over the ministry, he announced that Indian railways will go for complete electrification by 2022. This resulted in the government asking GE to change their plans of manufacturing diesel locomotives. However when GE threatened how such a breaking of the contract can affect future foreign direct investments, government rescinded their decision and agreed to comply with the original contract of manufacturing diesel engines. Before signing a contract with GE, did Indian government study the pros and cons of diesel versus electric engines? Did they undertake a scenario analysis to find out what happens should the government decide to adapt complete electrification? Can such a major investment of constructing diesel manufacturing plant lasting over 30 years change in mere four years? Table-1 gives key statistics of three forecasts of India’s primary energy demand. Though they are not comparable, some useful observations can be made. Total energy demand in 2035 as per BP is 1803 million tons of oil equivalent (MTOE) while IEA and DNEP predict it to be 1909 and 1862 MTOE respectively. Thus, BP is far more bullish in predicting energy demand (if we add demand for five more years) than the other two. However, there are some significant differences in how the total energy demand is met. While DNEP forecasts significant reduction in contribution from coal, other two are not so optimistic. On the other hand, DNEP is optimistic in increasing the contribution from renewables, other two are less pessimistic. But all three have more or less similar contribution from oil and gas ranging between 31.8% and 30.8%. This clearly shows that all three have ignored the potential impact of energy transition from fossil fuels likely to be brought about by Electric Vehicles (EVs) and renewables. There will be massive energy transition taking place because of the four factors outlined below. Rapid drop in the price of renewables like wind and solar. Faster penetration of EVs in transportation sector because of their competitive price against the internal combustion engines (ICEs). Faster adaption of distributed power with improvement in storage battery, digitization (smart metering) and nanotechnology. Finally efforts to decarbonize energy sector to reduce greenhouse gases to combat climate change and the approaching end of coal era. It is not obvious based on the statistics given in Table-1 that the three forecasts discussed earlier have fully or even partially reflected the impact of massive energy transition. In the beginning of the 20th century, horse drawn carts were replaced in mere 15 years by ICEs. Some experts predict a similar development with electric vehicles. Such a massive change in transportation is bound to have an impact on oil demand. In India, consumption of petrol and diesel in transportation sector accounts for 40%. The same is even more true for the world oil consumption. Based on USEIA 2017 world energy outlook, oil demand will be 113 million barrels per day (mmbd) in 2040 and 56% of oil is used in transportation. On a very conservative basis, even if 20% of global fleet adapt EV technology, oil demand can decrease by 20 mmbd. As discussed earlier, none of the major forecasts show such dramatic decrease in oil consumption. This is one of the major uncertainties energy planners are facing today. Few years back, there was the fear of Peak Oil Supply. It implied that the world will not have enough oil reserves. Now there is the excitement (if one is not an oil company or member of OPEC) of Peak Oil Demand (POD). This implies that some oil reserves may not get developed. 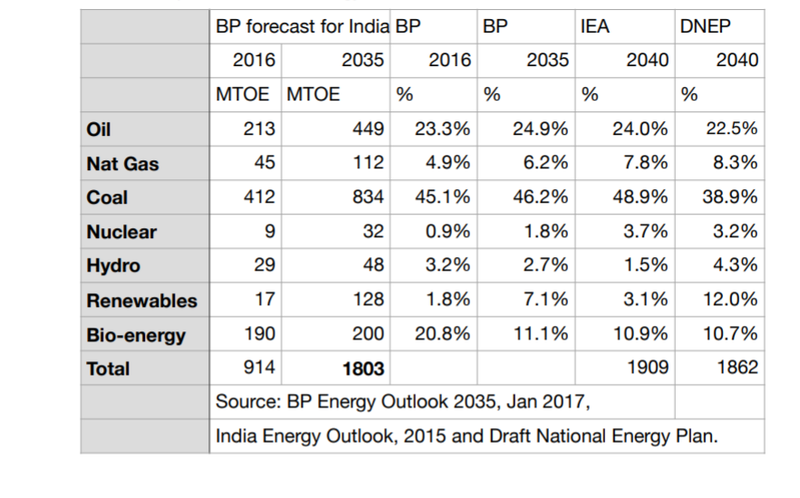 Both IEA and BP expect POD to take place after 2040. However Shell and Statoil expect POD to occur between 2025 and 2030. ExxonMobil and Chevron do not even consider the possibility of POD. Such a divergent view of peak oil demand clearly shows the difficulty of getting ready for energy transition. Factors affecting POD are adaption of EV technology, policies to fight climate change, absorption of new fuel energy efficiency, etc. Surprisingly BP does not think EVs are a game changer! Countries like Norway, France, Britain, Netherlands and some European countries have declared the goal of banning ICEs between 2025 and 2040. China has announced its intentions to ban ICEs by 2030. India is even more ambitious. Government has asked NITI to draw up a plan for India to have only EV sales by 2030. NITI’s current target is 44% for the fleet to be EVs by 2030. Even assuming that India will be able to meet more than 75% of the target, it will reduce the consumption of petrol and diesel significantly. This in turn will have an influence on future refinery yields which will have far reaching impact. World’s car manufacturers like GM, Ford, BMW, Daimler, etc are also announcing plans one after the other to produce EVs. Volvo and Jaguar have announced plans to produce only EVs and hybrids after 2020. Tesla, the first car company to develop EVs will soon have plenty of competition. However in India, we do not see such exciting development. While Mahendra is producing some EVs, and Maruti has made some announcement to get into the market, there is no such exciting development in EV sector. Only the government is making a lot of announcements, but no specific achievement yet. Just giving GST relief of 12% versus 43% for EVs and Hybrids is not enough. On the other hand, China has already taken a major initiative to force both the private and public sector car companies to start manufacturing EVs from 2019. Like the “black gold” oil on which India depends today to meet its oil consumption by importing more than 80%, EVs will shift the import bills and fuel security to “white gold” lithium. Researchers at Council on Energy, Environment and Water, estimate that to meet the complete electrification of vehicles sold in India by 2030, India needs 40,000 tons of lithium. Just four countries Argentina, Australia, China and Chile account for 95% of lithium global production of 35000 tons in 2016. According to Bloomberg’s New Energy Finance, out of global vehicle sales of 83 million, only 0.65 million were EVs. In other words as EVs become popular world demand for lithium will explode unless it is replaced by some material which is abundant and cheap. This clearly indicates to prepare for EV transition, India needs a robust supply chain to secure lithium and to support an aggressive R&D in battery technology. After all the car battery is the single biggest value item in EVs. Increasing number of EVs will need more number of charging stations and less number of the current petrol stations. EVs will also increase the demand for electricity and how and when these are charged will have a major impact on the stability of the grid. Are our planners for the private and public sector oil/power companies tuned to this possibility? Shell recently bought the largest EV charging company in Europe, New Motion as a strategic step to take advantage of EVs displacing ICEs. With dropping in solar and wind energy prices to compete with coal, India should seriously consider distributed power for electrifying villages. In recent months, during auction for wind energy, bid price of Rs. 2.64/kwh was lower than coal based power cost of Rs. 3.20/kwh. Last bid price for solar has been even lower at Rs. 2.44/kwh. Electrifying villages based on solar energy using distributed with or without connecting to the grid will revolutionize power market in India. It will be similar to the rapid spread of cable TV which met 60% of the Indian market in less than 10 years and provided employment to thousands. Mobile telephony is another example. Each village can have a micro/mini unit based on distributed energy using PV solar energy. Already a Smart Power India, an NGO supported by Rockefeller Foundation has supplied power to about 106 villages in UP, Bihar and Jharkand meeting the power needs of 42000 through mini grids. Their model can be replicated in other parts of India with some refinement if required to meet the goal of supplying power to all by 2022 and also on 24 X 7 basis. It is surprising that why NITI did not incorporate such a model while developing DNEP though the plan provides for 120 GW of distributed power (10% of total generating capacity) in 2040. As India like the rest of the world shifts from coal and other fossil fuels to renewables, India should also launch a new initiative for this dramatic transition. One of the guiding principles for energy transition should be India’s civilizational value of “simple living and high thinking” and not to maximize gross national product as other countries do. India’s overriding goal (not just in words as in the past but in deeds) should be to reduce grinding poverty. Energy plays a key role in improving standard of living as we have seen throughout history. During the last ten years, India has succeeded in reducing energy growth to GDP growth to 0.77. This is a remarkable achievement considering it was more than 1.0 for all developed countries during the early part of their development. But it has not succeeded in either giving electricity to all nor providing modern cooking fuels to all. Historically we have seen how the mankind transited from wood to coal starting in late 17th century, and then to oil from late 19th century. Now finally the era of renewable energy sources has arrived and India should plan aggressively and smartly to leapfrog to the new era by avoiding the investment needed by fossil fuels.